The Dark Ranger: Looking Scary? Turns out Glen Sather has secured most of the team with about $11 million left to secure the following free agents: Petr Prucha, Sean Avery, Brendan Shanahan and Henrik Lundquist. The absolute scariness is that prior to the Chris Drury and Scott Gomez signings ($5-6 mill each for multiple years), Glen Sather (GM) and Don Meehan (Lundquist's agent) have been negotiating a 4-5 year contract in the range of $4-5 mill per season and our Ranger GM has relied on those good faith negotiations in determining how much they could spend during free agency. With two top-tier newcomers on the team, and next to Jags, Henrik Lundquist is probably the most important investment for the Rangers' future, and should be commanding equal to what the highest salary is as part of this franchise. Apparently, Sather is relying on Henrik to take less in order to sign all the needed remaining players this season. A tall order as Sean Avery will be looking in the $2 mill plus range, Prucha will command over $1.5 mill, Brendan Shanahan will need at least $2 mill (plus non-cap veteran bonuses), which leaves only $5 mill for Henrik - with no room to move. This is dangerous in itself as there is no flexibility on the team's part, unless Sather has a trading scheme at hand. The absolute priority is to maintain "The King" Lundquist -- one of the top tier goalies in the league - and it's only his third season. We expect him to guard our nets for the next ten seasons. Just as Sather took the time to lock up Callahan and Girardi quickly, he shouldn't have relied on talks prior to the free-agent-feeding-frenzy of this week. Though, with the power of our first two lines, we could play an entire season 6 on 5 and leave the goalie home! 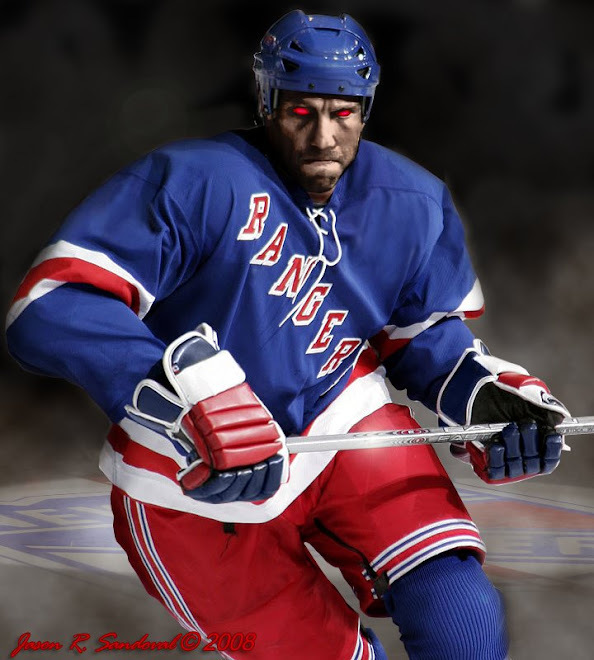 The Dark Ranger will watch over an empty net.....prepare.